Health Costs > How Much Does a Birth Certificate Cost? 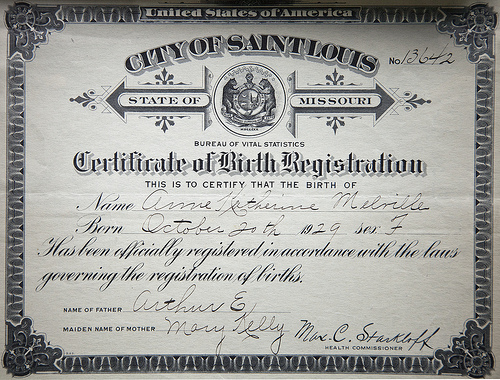 A birth certificate is a vital record that holds information regarding a person’s birth and can be described as an original document that certifies the circumstances of a birth. A birth certificate is necessary to do many things in life such as get a driver’s license or a passport. If your birth certificate has been misplaced or ruined, a replacement can be issued by the government. The price of getting a replacement birth certificate varies depending on the state you’re getting it in. On average, getting a birth certificate copy from your state is going to vary anywhere from $5 to as much as $40. Keep in mind that in order to get your birth certificate, you are going to need two forms of identification as well as your social security card. We researched every state and included the fees we had found in our table below. NOTE: These were prices from counties within the state. While most counties will vary, the price seems to be similar across the board within the state lines. Always refer to your local Health Department for exact prices. All prices were taken from the official Health Department websites. Birth certificates are available at all local Department of Health buildings or depending on the state, it can also be available via email, fax or mail. To find out where you can get your birth certificate, you can use the official CDC search. While most states will have its own legal requirements to obtain a certified birth certificate, most will have similar protocols. This will include filling out an application online or in person, showing a valid form of identification/s, signing the application and reason why you need the certificate. Depending on the state and the demand, the average turnaround time can be 30 to 60 days on average. On your birth certificate, it will include your full name, time/date of birth, the city/county you were born in and your parents’ full name, including your mother’s maiden name. Some certificates, depending on the state, may also include additional information such as the birthplaces of your parents, additional information about your parents and the name of children your children may already have at the time of your birth. Additional copies of each record can be an additional cost, usually 20 to 40 percent less than the first copy. Rush orders are available in some states. If this option is available, it appears it can cost three to four times more; again, depending on the state. You will need a birth certificate to apply for a passport, apply for government benefits, enrolling in some schools, joining the military, claiming benefits or receiving your driver’s license.